Banks Gilberti paddles in as Jens Peterson Backside Flips the slant. 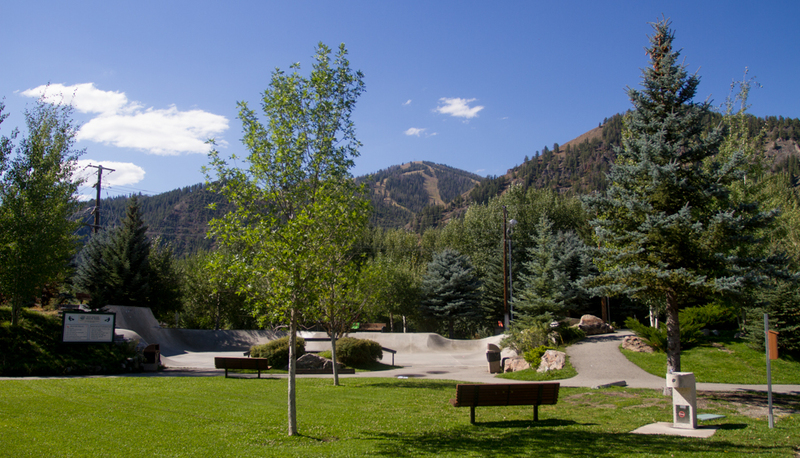 Ketchum and Sun Valley may be known for many outdoor opportunities like biking, hiking, skiing, camping and so on, but what many people do not know is that it is also a well known Skateboard destination. For years the only places you could skateboard on Dreamland Skatepark concrete was the Pacific Northwest (Mainly Portland and surrounding Oregon areas). Somehow, through the hard work of a number of local skaters, businesses (Board Bin) and the surrounding cities, we managed to finagle the construction of two Dreamland parks within 10 miles. Parks that have seen everyone roll through, Van and Tent style. From Tony Alva, Tony Hawk, John Cardiel, Peter Hewitt, Tony Truhillo and on: the gamut of well know as well as lesser known skaters and film companies - they all got in the van and came for a few days. Just recently, Christian Hosoi popped up spread his flavor of gospel and stoked the kids out with his enthusiasm. The Ketchum Skatepark which still sits on the original Skatepark Lot with its keyhole bowl, and over vert pocket. Notice the grassy chill zone for a late afternoon BBQ with your buds. The Hailey Skatepark with a recent street expansion. It boasts a 16' full pipe and 13' deep end and a number of challenging features. Roll over that beasty full pipe and tell me that doesn't get your heart pumping. I am not sure if back in 1996 when local business Pointer Masonry poured the first slab of concrete at the Ketchum Skatepark they knew how big it would get. In a few short years it was voted Ketchum's most used park and at one time incorporated concrete with a wooden x-games style course (see video below). It was impressively done for a small community of skateboarders, who would build and take down the structures every spring and fall. Eventually over the years and through the evolution of the sport into the forefront of our culture, we would fund raise and rally and eventually buil permanent professional level parks. Hailey would also follow suit and so the culture here started. Have a look at the vintage videos I did years ago for more on the history of skateboarding here. Its funny how skateboarding goes. You end up heading to the park with your buddy, and before you know it five of your best friends show up too. It was late in the day last week when Banks and I headed over to do a little session shooting. 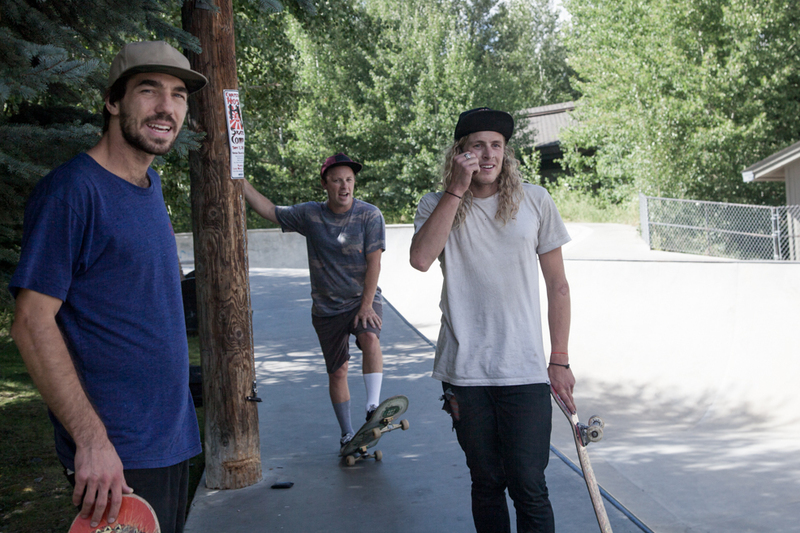 When we showed up, our good friend and snowboarder Scotty Pike, was killing the park solo, and soon after US Pipe coach Ben Verge, skier Collin Collins, and local skate legend Jens Peterson showed up and the session was on. I hadn't skated all summer, due to an injury, and it was nice just being there with all my buddies having the park to ourselves and having one. Ben Verge with a styled out Air into a Bert slide. When I think about skateboarding over the years, it is one of those things that was special and I think the reason many of us chose to do this solo sport. To me it always transcended age, or socioeconomic differences or gender, and so on. It always seemed that at 13 when I started skating some of my greatest friends were well into their late 20's or early 30's and many of those people I still consider to be as good of friends today - we built a culture here around that acre of space and that sport, and it has been flourishing for almost 20 years now. To this day I feel that that sentiment is what has always made our parks great. They are approachable, fun places for anyone to go and learn, and it is not uncommon to see a random older skater helping a groom learn to drop in, or do a kickflip or pushing him to try something difficult and land it. Banks with an air to Frontside 50-50 on the slant wall. Sit down - drink a beer - grill a dog and enjoy a day at the KSP.